Saturday was the day of errands. I was out of kitty litter and the cat food was getting low. Gotta buy both when they are on sale. We're getting close to the Muscular Dystrophy Labor Day Telethon. Tie ins asking you to buy something to support MDA are starting to appear in stores. I've crossed paths with them several times already. At Dominicks, they were offering up root beer floats for a buck "donation". These kinds of things strike me as just a bit on the shady side. I'm fairly certain the store employee serving up the float would not give you one if you didn't play a dollar. But, if you are buying the float, they have to charge sales tax which diminishes the return to MDA, which, in reality, isn't as much as this feel good gesture would have you think it is. So, they call it a "donation" even though you have to pay it to get the float. It was a root beer float in an 8 ounce Solo cup. There was a woman behind me which led to the anemic version of a float that I got. Root beer foams when it comes in contact with ice cream. 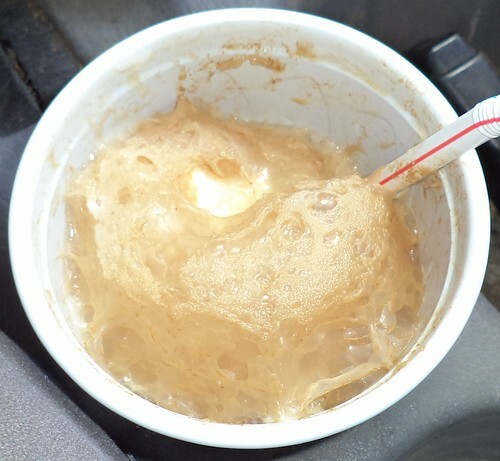 If you do this right, you wait for the foam to die down a bit and then add more root beer so you get, effectively, 5-6 ounces of soda with 2-3 ounces of ice cream. But because the woman behind me started quizzing the guy about how he intended to prepare her float so as not to pass germs from dirty money, he didn't give my float the care she got. She made him take her money and change his latex gloves to scoop the ice cream and, as I was walking away, she demanded he change his gloves again to hold the 2 liter of root beer to pour it into the cup. Nevertheless, the root beer had been chilled and the cold goodness, even only 4 ounces worth, was delightful on an August Saturday.